1) Which classic Orson Welles thriller featured the mysterious character 'Harry Lime'? 6) Who directed the 1950 classic "Sunset Blvd."? 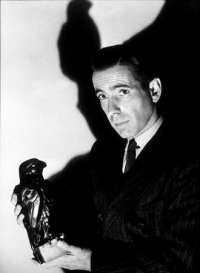 2) What's Humphrey Bogart holding? 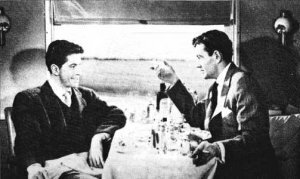 7) What 1950's classic is this pic from? 3) Who turned out to be the Nazi spy that was smuggling classified microfilms out of London, in the 1944 flick "Ministry of Fear"? 8) What was the girl who escaped from the psychiatric ward wearing, at the start of the Mickey Spillane flick "Kiss Me Deadly"? 4) What did Gregory Peck see on the curtains in his weird dream, in the Hitchcock classic "Spellbound"? 9) Where did the killer of the classic noir flick "Laura" hide his murder weapon- the shotgun? 5) In "The Big Clock" (basis for the Kevin Costner flick, 'No Way Out', by the way) how did the murderer, Mr. Janoth, die? 10) Who does Bogey fall for, but end up sending to jail, in the endlessly convoluted film noir gem "The Big Sleep"?